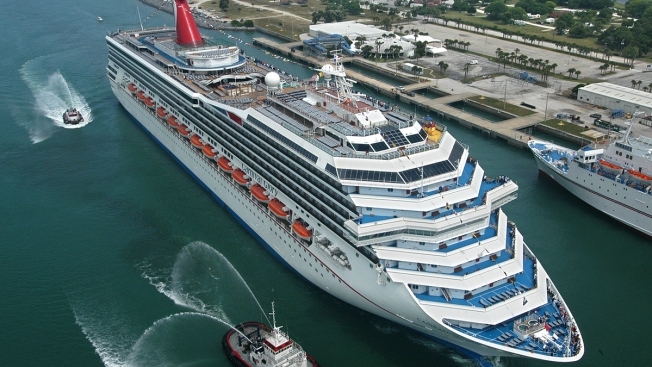 This July 11, 2003, file photo shows a Carnival cruise ship, the Carnival Glory, in Cape Canaveral, Florida. After a Coast Guard aircrew spotted the stranded Cubans at about 8:40 a.m. Sunday about 130 miles off Mexico's Yucatan Peninsula, it radioed for any nearby help, officials said and NBC News reported. The harrowing journey began a week ago when 22 people boarded a wooden boat in Cuba, headed for Mexico, when its engines lost power and became adrift at sea for three days, the Coast Guard said. Those original 22 travelers were picked up by a Cuban-Mexican national in his sports fishing vessel before that craft also lost power, and was adrift at sea for another three days, according to the Coast Guard.